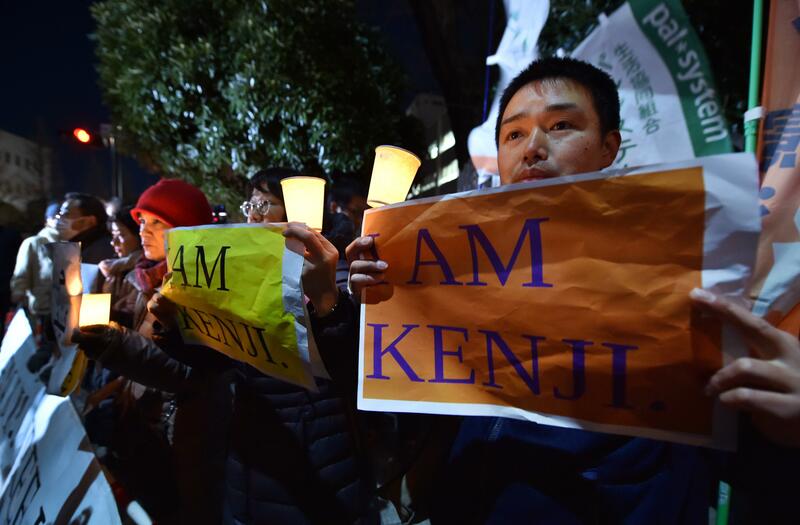 After the killing of Kenji Goto, Will ISIS Push Japan to Give Up on Pacifism and Go to War? Will ISIS Push Japan to Give Up on Pacifism and Go to War? A rally near the prime minister’s official residence in Tokyo on Jan. 28, 2015. The videotaped execution of American journalist James Foley was the primary event that galvanized U.S. public support for airstrikes against ISIS. France stepped up its involvement in the campaign following the terrorist attacks in Paris last month. Will ISIS’s beheading of Japanese journalist Kenji Goto over the weekend, as well as another Japanese hostage, Haruna Yukawa, a week earlier, draw Japan into deeper involvement in the Middle East and a more militarized foreign policy in general? Prime Minister Shinzo Abe certainly seems to be implying this, vowing “to make the terrorists pay the price”—an unusual statement for a Japanese leader, but one in keeping with Abe’s push for the country to abandon its pacifist foreign policy. Under Article 9 of the constitution imposed by the U.S. following World War II, Japan vows to “forever renounce war as a sovereign right of the nation and the threat or use of force as means of settling international disputes” and refrain from maintaining military forces. But the country has been inching away from that stance for a while. Japan’s well-equipped “Self-Defense Forces” are a military in all but name. In 1992 the parliament passed a law over public opposition allowing these forces to participate in peacekeeping operations and they have done so in several cases, including the Iraq War. This movement toward militarization has accelerated under Abe, who has loosened the country’s ban on weapons exports, and pushed a revisionist view of World War II history, which holds that the country has been too apologetic for its wartime actions. His Cabinet has reinterpreted the constitution as allowing for “collective self-defense”—coming to the aid of allies under attack—though parliament has to approve this change before the military can actually act on it. This shift has been motivated primarily by concerns over China’s growing power and the threat from a nuclear-armed North Korea, but Abe has also waded into conflicts further afield. Last month, before the hostage crisis, he pledged $200 million in nonmilitary aid for the Middle Eastern countries involved in the fight against ISIS. “Should we leave terrorism or weapons of mass destruction to spread in this region, the loss imparted upon the international community would be immeasurable,” the prime minister said during a visit to Cairo. Goto’s killing might seem to bolster Abe’s case for the need to let the country’s military off the leash. But the prime minister’s moves have been controversial—a poll taken last spring found that 64 percent of Japanese citizens opposed his push to amend the constitution and that opposition had increased under his tenure. Perhaps more importantly, the Japanese public isn’t always all that sympathetic to hostages captured overseas. As the BBC notes, when a group of Japanese peace activists returned home after being taken hostage in Iraq in 2004, they were jeered at the airport and had to go into hiding for months. Yukawa’s father and Goto’s mother have both issued statements apologizing for the “inconvenience” their sons’ capture has caused Japan. Some in Japan are also blaming Abe’s activist foreign policy for Goto’s and Yukawa’s deaths. ISIS originally demanded $200 million in ransom for the two hostages—the same amount Abe had pledged to the countries fighting the group earlier last month—and demanded the Japanese government give up its “foolish” support for the U.S. military effort. Opponents of the constitutional changes are likely to make the case that Abe’s militarism has made the country’s citizens a target. While Abe and his allies may see these killings, which one former diplomat called “9/11 for Japan,” as evidence that Japan can no longer afford to be isolationist in the face of threats, large segments of the public are likely to see them as evidence that the island nation just shouldn’t get involved.